Very large, modern, comfortable house Kiotari Villas, semi-detached. In the district of Kiotari, in a quiet, sunny position, direct access to the beach. Private: large, well-kept garden 2'500 m2 with lawn for sunbathing, swimming pool angular (50 m2, 01.04.-30.11.). Outdoor shower, barbecue. In the house: table tennis, air conditioning, washing machine. Linen change weekly. Towel change weekly. Room cleaning weekly. Airport transfer (extra). Parking at the house. Supermarket 1.5 km, restaurant 1.5 km, cafe 300 m. Nearby attractions: The Valley of the Butterflies 55 km, Natural Park of Kalathos Mountain 15 km, Castle of Asklipio 7.8 km, Kiotari Village 3.7 km, Hortis Wild Life Reservation 3.7 km. Please note: car recommended. Suitable for families. The photograph shows a typical example. There are more similar properties for rent in this same residence. Property ref. GR5020.1.1 is situated on the same property. 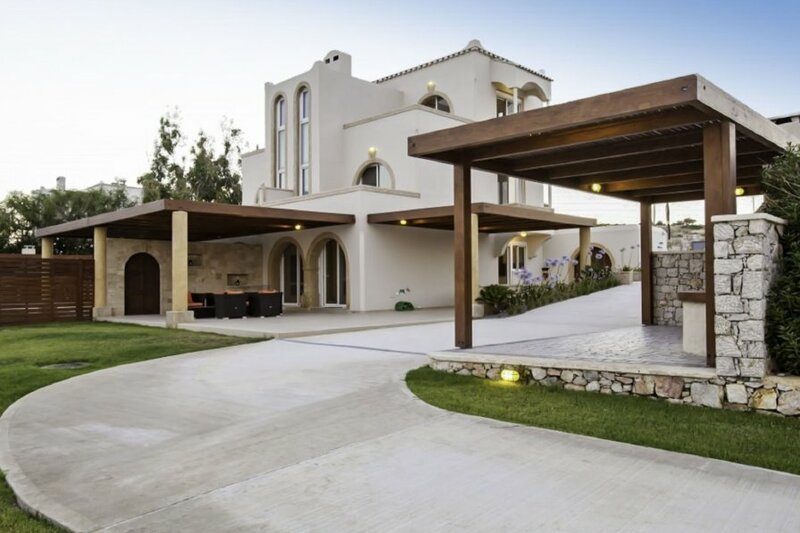 Kiotari Superior Villa, 4-room villa 190 m2 on 3 levels. Spacious and bright, comfortable and modern furnishings: open living room with 1 sofabed (140 cm, length 200 cm), open-hearth fireplace and TV (flat screen), CD-player. Exit to the garden, to the terrace. Large, open kitchen (oven, dishwasher, 4 ceramic glass hob hotplates, microwave, freezer, electric coffee machine) with dining table. Bath/WC. Air-conditioning. Upper floor: (open staircase), 2 rooms, each room with 1 double bed (160 cm, length 200 cm), TV (flat screen). Exit to the balcony. Shower/WC. Air-conditioning. 2nd upper floor: (open staircase), 1 large room with 1 double bed, shower/WC and TV (flat screen). Exit to the balcony. Air-conditioning. 3 balconies, large terrace. Barbecue, deck chairs. Very beautiful view of the sea. Facilities: washing machine, safe, iron, mosquito net, hair dryer. Internet (WiFi, free). Suitable for families.